As our lead quarterback, Johnny Clark has to have a good set of eyes to see the entire field. Johnny Clark (PASS) – Johnny moves up from back-up last year to first-string this year after winning the PASS (a deep northeast-based super late model series) championship. And I’m telling you this guy has a little Terry Bradshaw (former Pittsburgh Steelers great) in him. Last year he had the full-beard, but after winning the DNK 250 (big money SLM race in Unity, ME), he shaved it (well, at least down to a nicely groomed goatee). That’s Bradshaw-esque. Being a Northeast boy he’s used to cold weather climates; that’s perfect for playoff time. up some big numbers just the same. Six wins and eleven top-5s in 13-races in the Midwest Series makes for a killer season. And remember, he put longtime series kingpin Steve Carlson on the bench while racking up those numbers. Only one other guy (Brian Hoppe) has been able to do that in the last decade. But also like Manning, Diercks did not win the big game, the All Star Showdown in Irwindale, CA. Maybe he should grow a beard and not shave until he does; after all, it worked for Bradshaw and Clark. Hey, John Madden can have his own team even though he’s ONLY a broadcaster right now, so why not us here at 51. Just like John, I’m a television commentator as well (for SPEED Channel & Fox Sports), but unfortunately the similarities end there. He’s got a bus, I don’t. He’s got millions of bucks, I don’t. You get the picture. We do share another vision, the passion for the game we both represent. John loves football; I love racing, short-track style in particular. JR Norris (NASCAR Southeast) – We’re looking for the Eric Metcalf (Cleveland Browns) or Dave Meggett (NY Giants) of his time and JR Norris is that player. He doesn’t have to be the biggest dude in the world, but he has to know how to get the yardage when it counts and that’s JR. In his rookie season on the Southeast Series he had four poles, one victory and nine top-5 finishes in 12-races (more than any other driver). He finished second in points and is the favorite to unseat perennial SES champ Jeff Fultz in ’05. TC was all smiles about being named our starting running back. 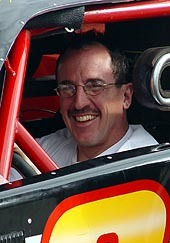 Ted Christopher (Mods & More) – Your number-one runner has to be quick, strong and able to read defenses in a fraction of a second; TC is that man. He had 11 different rides this year in a half-dozen divisions. You know he knows how to read defenses because he won in more than half of them. He’s strong like Corey Dillon (New England Patriots RB), yet he’s got the nasty demeanor of a linebacker when he’s got his game-face on and that’s what makes him so good. 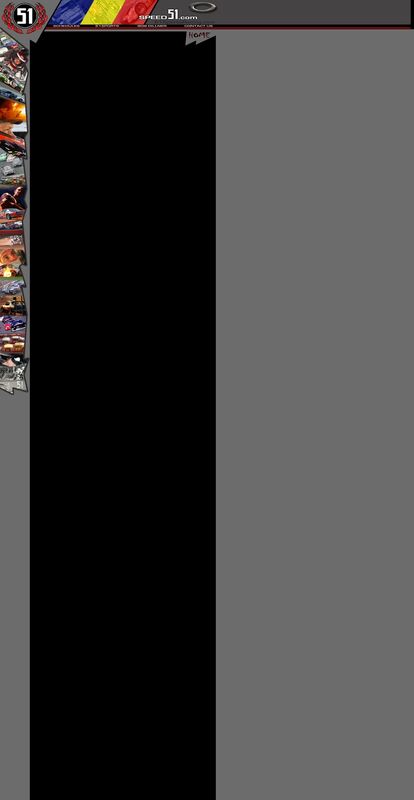 Donny Lia (Mods) – The Pittsburgh Steelers showed this year, with their running back combo of Duce Staley and Jerome Bettis, why it is so important to have two good backs. That’s why Donny Lia is just as important. He makes up an all modified back-field on the All-Dillner team. He’s fast (evident by his season-long Bud Pole Award on the Modified Tour) and he knows how to win (three victories on the season, including in one of the biggest games of the year: the North-South Shootout in Concord, NC). And have you ever looked at him, he just looks like a running back. Burt Meyers (Southern Mods) - Matt Suhey is one of only two third-generation players ever to walk on an NFL field. In 1983 he had a career-high, 681-rushing yards, but he did go to the big dance, the Super Bowl, with the Chicago Bears in 1985. Why do you need to know all this? You don’t. 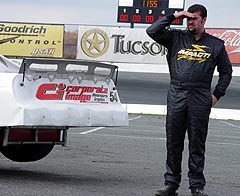 But like Suhey, Burt Meyers is one of very few third-generation drivers in the Modified wars in this country. 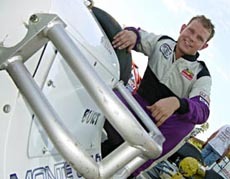 He was the 2002 SMART champ and is a two-time Bowman Gray Stadium (NC) champ. And he’s a trash-talker, so he’d probably give one hell of a touchdown celebration. (formerly of the Cincinnati Bengals). Andy is tall and we like that when going against some of the smaller defensive backs these days. He too knows how to win as evident by his third straight Busch North title. Charlie Bradberry (Super Late Models) – Let’s just copy and paste what we said last year about Charlie because not much has changed; he’s still our number- one TE. After all he’s got that tight-end build; not too big, but not too small. And he’s a tough quiet guy; doesn’t that sound like a tight-end? He reminds us a lot of Wesley Walls, formerly a Carolina Panther but now a Green Bay Packer. 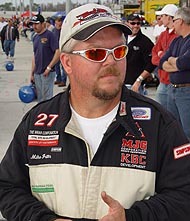 He knows how to win the big game as evident by his 2003 Snowball Derby victory and Southeast Series title the same year. Jeff Fultz (NASCAR Southeast) – The guy that Bradberry beat for the title in 2003 was perennial titlist Jeff Fultz. In fact, our tight-end squad in comprised of the last two Southeast Series champions. Fultz was one of our receivers last year, but with his size we like him better at this position. He got to the end zone five times in 12-tries in SES competition, plus we like the fact that he wheeled a Modified a couple times as well. Ed “Bubba” Zwickel (Riverhead Raceway, NY) – He’s a big man! How big is he you ask? So big that he once caved in the roof of his car during his championship celebration in victory lane at “The Head.” Also gotta love that he was a champ in the “Blunderbust” class. Burth Meyers is as talented as they come in the Southern Mods. 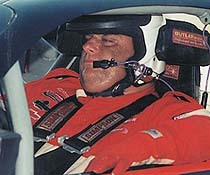 John Silverthorne (Super Late Models) – Here’s the true definition of a gentle giant. He may be a big boy, but he’s also one of the nicest guys you’ll meet anywhere. “Big John” could certainly score well in the “Pancake” category for offensive lineman. Don Satterfield (Pro Cup) – He’s part of our 300-plus brigade. Good part about him, he’s hard to move on the racetrack; that’s a perfect quality for an offensive lineman. His nickname is the “Hawk,’ but we still can’t figure that one out. He’s certainly not stealth like a hawk. Jim Pettit (Southwest Series) – Ok, so he’s not 300-pounds, but he is a big guy. He won the Southwest Series championship this past year, so he certainly knows how to squash the competition, right? And he’s one of the nicest guys in the biz. John Silverthorne heads our offensive line. Steve Holzhausen (Super Late Models) – With a name like that you gotta be one our offensive line. He too is not a 300-pounder, but he’s certainly carried his weight in the Late Model wars of Wisconsin for quite some time. And wouldn’t it be cool to see that name on the back of a Jersey walking out onto the frozen tundra on Lambeau Field? Florida "fastman" Mike Fritts just looks like an NFL fullback. Mike Fritts (Super Late Models) – Fullbacks need to be tough and that’s Mike Fritts. From his build (he kinda looks like a Darryl Johnston – former Cowboys all-star full-back) to his on-track prowess. Fullbacks need to know how to score and Fritts has been scoring in the Florida Super Late Model scene for some time now. Gary St. Amant (Pro Cup) – Everybody is worried about age these days, but you know what, we don’t give a damn and that’s why Gary St. Amant is our man at the fullback position. Besides the fact that he has the size of a fullback (sorry Gary, we love ya man), he’s one of the most prolific short track drivers of his generation and at age 42, he may be no spring chicken, but he did win the USAR Pro Cup Rookie of the Year. Now that’s funny. (after all, he learned from one of the best, his dad, Rusty Wallace) and now he’s beginning to back it up on the field, oops, I mean track. He won a few UARA races near the end of the year and he won the Super Bowl of Super Late Model racing in the Snowball Derby in Pensacola, FL in December. Jamie Yelton (UARA) – Terrell Owens (Philadelphia Eagles) has proved being big, strong and fast are the ingredients for being one of the best receivers in the biz and that’s why we want Yelton in our four-receiver set. He was a hotshot in the UARA STARS (Late Model Stocks with four-barrel carbs) Tour this year. He finished second in points and he’s our second receiver.